This week, we brought in Dance Dance Revolution (DDR) into our classroom as a class reward for our Intermediate students as well as for our daily physical activity (DPA) requirements. We’ve been thinking about bringing in Dance Dance Revolution into our classroom since last summer, but didn’t actually start to research specifics and the benefits of having DDR in our school until October. Although we’ve used Dance Dance Revolution in our programming before at a teen drop-in center / community center, yesterday was the first time we actually played DDR with our students in school. Here’s our review of using Dance Dance Revolution Hottest Party (Nintendo Wii) in our Grade 7 and Grade 8 classroom. What’s the benefit of using Dance Dance Revolution in the classroom? Dance Dance Revolution is a music video game where players move on a dance platform and score points by stepping on the correct arrows on the dance mat by watching the screen and listening to the music. We brought in Dance Dance Revolution for our students as a class reward, but also to see if it would work as DPA (daily physical activity). We ran the DDR game as a competition. Students were randomly placed in order and played against each other four at a time. The top two students progressed to the next round. Everyone “had” to play, but towards the end, only one or two reluctant students still had reservations about playing. Most other students seemed to get into it. As a class party game, Dance Dance Revolution allows you to have up to 4 players going at the same time. (Compare that with other games that only allow two players.) Four players means that it’s easier to get through your class quicker. You’re physically active when you play Dance Dance Revolution. It doesn’t compare with running a marathon, but it’s considerably better than just sitting down. Several students commented on how much they were sweating after playing DDR in the class. It’s popular. Over half of the class had played DDR at home or at the arcade before. Kids could recognize songs and were humming along on both DDR Hottest Party 1 and the sequel, Hottest Party 2. In our Gr 7/8 classroom, we projected the Wii Dance Dance Revolution game onto the wall and played the music through our stereo system. We had four dance mats (one wired mat and three wireless) and both the original and the sequel Hottest Party Wii DDR game. We teach using a data projector so we’ve already permanently set up our digital projector to our computer. The LCD projector sits on top of our filing cabinet and we’ve taped white paper onto the wall to create a giant 8 foot by 12 foot screen beside our blackboard. We’ve also created podcasts in our classroom using audacity, so we had already brought in an old amp and sound system to hook up our computer to. All we had to do was bring in a Nintendo Wii, the Dance Dance Revolution video game, and four mats and we had an instant class party / DPA activity. We used a combination of Shoppers Optimum points and PC points to save up enough money to buy a Nintendo Wii. We’ve also generated around $100 from advertising revenue from this website which subsidized the purchase of two wireless dance mats. There are several different ways you could use DDR. As a class reward / class party. Some of our colleagues had a class party where they brought in several game systems and let the students play. One colleague had a Playstation at one end of the room and a Wii (with Dance Dance Revolution) at the other end of the room. As part of a structured phys-ed class, Daily Physical Activity (DPA), or extra-curricular activity. 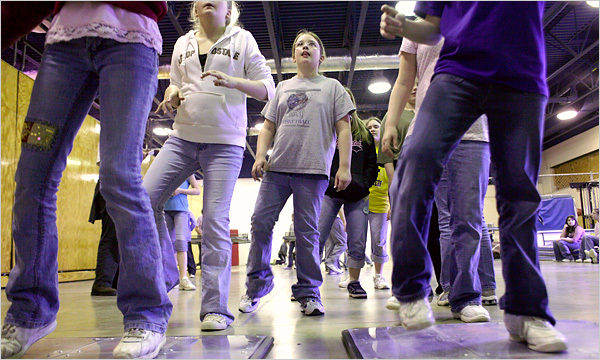 Several schools are using Dance Dance Revolution as a way to hook students into a more active lifestyle. One of our students pointed out that his previous school held an event where they brought in Dance Dance Revolution into the gym using a projector and four dance mats. Richard pointed out that there were three classes doing the activity, so he only got to play once. Teen drop-in / community center program. We’ve run teen drop-in programs / community center programs for youth between the ages of 12-17. Some of the scheduled activities included a Dance Dance Revolution competition and a Rock Band / Guitar Hero competition. In our experience, we did notice a gendered difference in the teens who participated in the events: Dance Dance Revolution seemed to appeal more to teenage girls and Guitar Hero / Rock Band seemed to attract more teenage boys, but there were always several teens that broke the stereotype. As a general rule, we found that Dance Dance Revolution competitions were harder to get buy-in from the teens to participate. This was probably because 1. playing DDR required you to move on a dance pad which makes you more self-concious than lounging on a chair strumming a guitar, and 2. DDR seems to be either very easy or very hard. We’ve seen teens play Guitar Hero songs on expert with the guitar behind their head, but we’ve never ever seen anyone play the hardest level on DDR. Some teens were too shy to participate in a Dance Dance Revolution competition, whereas the guitar hero/rockband competition usually worked really well at the teen center. We turned off the handmote option for all 4 game mats because it just made things more complicated. (The Nintendo Wii version of Dance Dance Revolution lets you add the wiimote to the game, so you have to move your hand in addition to stomping your feet.) We couldn’t find the option to turn off the handmotes until a student who owned the game did it for us. Apparently once you’ve selected your character, you can go in and change the handmote setting for each player. There’s no global option that turns off all of the handmotes. If you re-start the game, you’ll have to go in and change the handmote setting again; the game won’t remember. Once a game starts, there’s no obvious way to end the game. (i.e. one of your students starts the game before all of the players are ready.) In order to auto-fail Dance Dance Revolution once it’s started, hold down the plus (+) sign on the wiimote or dance pad and the song will end. Be careful if you’re adding scores to keeping track of who wins (i.e. the person with the highest total score wins). James pointed out that it’s easier to score higher with some songs because you can earn more points (because they’re harder or longer.) Also, if someone accidentally hits the wrong button at the end of the game when the score is displayed, the game will continue and you can’t go back to see your score. We used the “random” option to select the song so that people who own the game can’t cherry-pick their best songs. We found that if you stood on the dance mats before the game actually started, sometimes it interfered with you selecting the right character or song. Even if you were standing still in the exact center of the dance mat and only tapped the A button to select a character or the up button to change your difficulty level, sometimes, the mat would think you pressed the B button to cancel and go back to the previous screen. DDR worked best for us if everyone got off the mats until the song was selected. It seemed easier to get the game going in Hottest Party 1 because you didn’t need all four players to hit the A button to select their character. One person could hit the A button and you would move to the song selection screen. We had a mix of wired and wireless dance mats when we brought Dance Dance Revolution into our classroom. The wireless mats (Intec) were more expensive (approx $50), but had thick (1″) foam padding and so were easier on the feet. On the other hand, they were harder to pack and store as well. There is a wireless dance mat made by i-con that costs around $30 that comes without the foam paddng, so it’s as easy to fold and sore as the wired mats. The i-con wireless mat also auto-detects the wii; the Intec wireless mats came with a wireless receiver that you had to plug into your Wii. The wired mats were cheaper (approx $20) and were thinner, which meant you could fold it up easily to store and transport it, but stomping around the mat was like stomping around on the floor – no cushioning at all. If you do end up buying a dance mat, make sure to get an extended warranty from the store. Apparently these mats are notorious for wearing out and with a few hundred hours of students stomping around, I imagine the extended warranty will help. Our classroom floor didn’t have a carpet, but the mats didn’t slip. We felt bad for the primary students in the classroom below us. When we do DPA in the classroom or move the desks around, it sounds like the sky is falling. It would be difficult to get all four dance mats spread out if they all had to be physically wired to the Wii. Having wireless mats did help as the cords weren’t long enough for us. Dance Dance Revolution did get kids active to some extent when they were playing. Most students stood around watching when it wasn’t their turn. Only a few students were practicing to step in-sync with the game, even if they weren’t on the dance mat. To do DDR as part of an extra-curricular or daily physical activity program, you would have to get the other students practicing while waiting their turn to be on the mat. Some students were good because they were natural athletes. Some students who you wouldn’t think of as being very active or into sports, turned out to be quite good at DDR, either because they owned the game at home or because they played a lot of video games and could time their movements better than the other students. By the end, a few kids were shy and still didn’t want to play. Other kids who were shy did end up playing and enjoying the game. Having students bring in videogames or videogame accessories is always a calculated risk. Things can always get stolen on-route to school or at school. Then again, it seems many of our students take this calculated risk every day as evidenced by the number of cell phones, ipods, iphones, PSPs, and Nintendo DS’s that we see around the halls. Dance Dance Revolution Hottest Party 1 and 2 are only sold bundled with a wired dance mat. The game is not sold separately, so this means you’ll be left with at least one wired mat. There are several companies out there targeting the educational market with a dancing game similar to DDR. These are dedicated systems that only run their software. They wouldn’t be able to run a different video game. Some students don’t have money for field-trips, but now want to get a Wii. Our classrooms are a mix of “haves” and “have-nots”. Some students receive subsidized funding for school activities while other students walk around with hundreds of dollars of technology in their pockets: cell phones, itouch, ipod. There is a relationship between materialistic desire and the status of being cool in teenagers. For example, one student got an itouch, and then within a few weeks, three or four more students in the class had an itouch or iphone. In a class where portable technology runs rampant and everyone has a cell phone (‘for emergencies’), does bringing in Dance Dance Revolution really make a difference? Having said that, when some schools have an eye on DDR is to fight obesity, especially in students who spend their time playing video games instead of being active, does Dance Dance Revolution come that much closer to becoming part of the curriculum? The Entertainment Software Ratings Board (ESRB) rates Dance Dance Revolution Hottest Party and Hottest Party 2 as “E10+” which means it may be suitable for ages 10 and older. They note mild lyrics and suggestive themes. In Dance Dance Revolution Hottest Party 2, three of the songs show actual music videos in the background (instead of the characters dancing). One song had some girls dancing and a few of the students said it was “awkward”, so we held down the plus sign on the wiimote to auto-fail the song and skip to a different song. There is a Dance Dance Revolution Mario Mix version available for Nintendo’s GameCube which can also be played on the Wii. This DDR game is rated E for everybody and includes Mario, Luigi and other Nintendo characters dancing. It might not appeal to older audiences, however. We live in a digital age. Our students are digital natives born into this digital culture; the teachers are digital immigrants who are learning to become digital. Dance Dance Revolution won’t replace intramural or competitive sports at your school, but it might be a way to hook in the video-game crowd into a more active lifestyle. What are your thoughts on using games like Dance Dance Revolution in the classroom? I wish my teachers’d have this great idea of bringing ddr into school. Im really a fan of the game, this far I lose 6 lbs with it, plus it’s the only exercise I’m able to do with regularity, and even if it’s not the best, we should do what pleasure us, right? Besides is a good way to have fun with my family, I’ve never seen my aunt gaming before DDR or wii sports, same goes for mom. Wow.. how exciting.. indeed it really sounds revolutionary. A radical teaching style using the latest gaming technologies will surely caught students interest and attention.